There is no doubt that the invention of the elevator has changed the way we move and build. 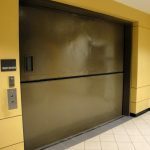 The earliest elevator prototypes appeared in the Middle Ages, and from there, they have evolved into the variety of different kinds of lifts that we rely on today. Hoists: The first rudimentary hoists appeared in the third century B.C. These hoists could be powered by humans, animals, or water-driven systems. A hoist often used a system of ropes and pulleys to lift up people or large objects like pieces of stone and wood to be used in building construction. Without hoists, many ancient monuments would not be here today. Steam Hydraulic Elevators: The next evolution of the elevator introduced the use of steam hydraulics to power the lift system. Steam hydraulic systems came about during the Industrial Revolution in response to the need to move large amounts of raw materials like lumber and coal. These elevators were able to lift bulk materials out of mines and factories. English architects Frost and Stutt invented an elevator called the Teagle, which was a powerful lift that used a counterweight to give it an extra boost of power. These steam-powered elevators led to inventions like the elevator shaft, leading to machines that are more recognizable as the elevators we use today. Motor elevators: After the invention of electricity, it wasn’t long before elevators joined the ranks of machinery powered by motors. German inventor Werner von Siemens invented the first electric elevator in 1880. This elevator was faster, safer, and more efficient than the steam elevators of the past. Frank Sprague added safety features, floor control, acceleration control, and other important components that to this day keep our elevators safe and highly functional. 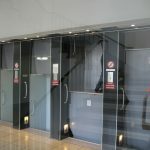 Passenger Elevators: When most people think of elevators, they think of passenger lift types that transport passengers from floor to floor. 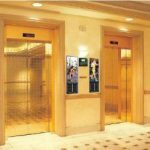 These elevators can have additional features, too, including loudspeakers to play music or announcements, audio or visual advertising, or television displays. Express elevators are a popular variation in high-rise buildings: They run from the ground floor to a sky lobby, skipping the floors in between. Freight Elevators: Freight elevators are designed to carry goods, not passengers. These large elevators can carry heavy loads, typically much more than a passenger elevator can carry. A rugged interior protects freight elevators from the wear and tear of loading and unloading cargo. Sidewalk Elevators: These are similar to freight elevators, as they are also used to move cargo. 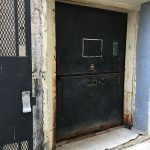 Sidewalk elevators typically move materials to and from a basement and open directly onto a sidewalk. This makes for a fast and simple loading and unloading process. Stage Lift: The hydraulic lifts in this machinery raise and lower sections of a theater stage. 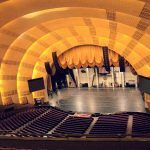 Radio City Music Hall famously has four of these elevators, which can lift entire casts and orchestras. Vehicle Elevators: A vehicle elevator is typically found in a garage or at a manufacturing center. These hydraulic lifts make a building more accessible to a driver. Some even rotate so that the driver only has to move forward and never reverse. Boat Lift: These elevators are occasionally found in canals and are used as an alternative to the typical lock system, which raises and lowers water levels. A boat lift physically moves the boat instead. Aircraft Elevators: Aircraft elevators can refer to an elevator that lifts an aircraft or an elevator located within an aircraft. An elevator for an aircraft lifts the plane from the flight deck to the hangar. An elevator within an aircraft lifts flight attendants with food and beverage trolleys between levels on double-decker planes. 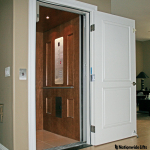 Residential Elevators: These are less complex than a typical passenger elevator. Many residential elevators feature unique designs that allow them to be more aesthetically pleasing and fit with the surrounding architecture. Some of these elevators are so small that they can only carry one to two passengers using a pneumatic lift system. 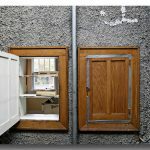 Dumbwaiter: A dumbwaiter has a similar purpose to a freight elevator; it’s just much, much smaller. These are sometimes referred to as lazy waiters, and they are primarily used for transporting small loads like food and books from floor to floor. They can be accessed by way of a small panel on the wall, much like a passenger elevator in miniature. The dumbwaiter was invented by George W. Cannon in 1883, and although the simple rope-and-pulley design has been upgraded, dumbwaiters are still in use today. Scissor Lift: Scissor lifts usually only move vertically and are supported by crisscrossing X-pattern mechanics. 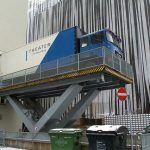 In most cases, the entire mechanism is mounted on a vehicle that moves the lift from place to place to carry passengers and cargo. 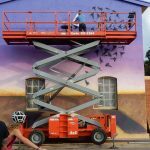 Scissor lifts are used by construction workers, stagehands, and electricians and are useful for any work that requires people and materials to reach a great height. Material Handling Belts: On a material handling belt, materials are transported using an inclined plane and a conveyor belt. 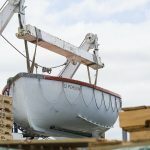 These are frequently used at docks to transport loose materials onto bulk carriers. 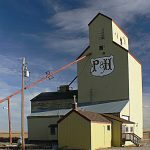 You can also spot this technology at work in grain elevators to transport feed on farms or hay elevators that drop bales into haylofts.